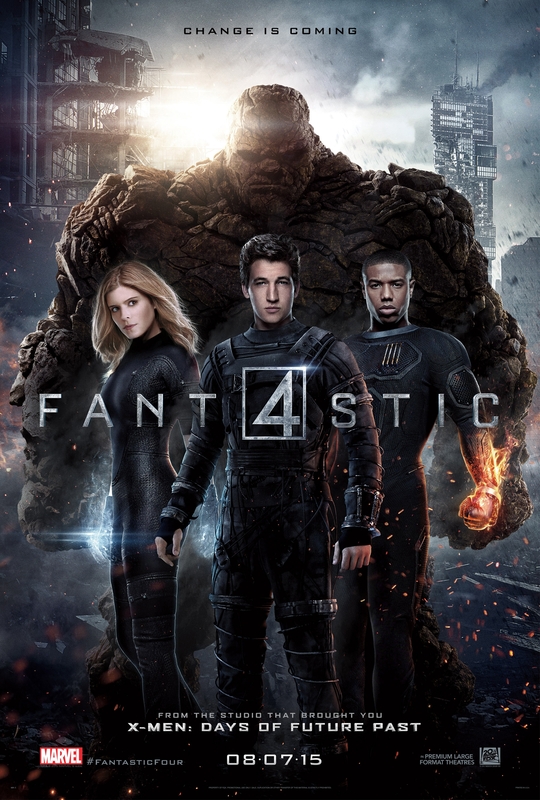 Josh Trank’s Fantastic Four -or Fant4stic as the posters say- gives Marvel’s first family the token reboot that seems to be making its way around all of the non Marvel Studios owned properties outside of X-Men. The last time Fox attempted to make Fantastic Four movies they didn’t go down so well with audiences. To my mind they weren’t great films but they also had a lot going for them. Ultimately it is better that there were only two of them and perhaps a reboot was the right way to go. Did it have to be this reboot though? I’m all for seeing these characters redone in a way that proves interesting but this fell way short of the mark in many ways. I’ve had my concerns about this film ever since information started coming out about how they were going to approach it and I found that almost every one of them came to life right before my eyes. The story follows the fantastic foursome before they became fantastic. Reed Richards (Miles Teller) is a child prodigy who gets headhunted by Franklin Storm (Reg E. Cathey) and his adopted daughter Sue (Kate Mara). They whisk him off to work for them in trying to figure out how to travel to another dimension. Reed has been working on that since before puberty so after a few years he’s gotten further than many geniuses in Franklin’s employ. Reed works with another former child prodigy Victor Von Doom (Toby Kebbell) and together they find the answer to dimension hopping. After an unsanctioned trip with Franklin’s biological son Johnny (Michael B. Jordan) and Reed’s best friend Ben Grimm (Jamie Bell) in tow Victor goes missing -presumed dead- while the other 4 end up with special powers. Reed ends up with the ability to stretch, Johnny can safely light himself on fire/fly/throw flaming projectiles, Sue can turn invisible/turn other things invisible/project forcefields and Ben becomes a hulking rock monster with incredible strength. The biggest problem with Fantastic Four is that the Fantastic Four feel almost like an afterthought to the overall story. Apparently this was always written as a Fantastic Four film but it feels to me like there was an idea to do a dimension hopping superpower movie that eventually had the Fantastic Four concept slapped on it in order to promote interest. Part of the reason it feels this way is that the story is so massively disjointed. Much of the run time of the film is spent developing the technology to travel to the alternate universe and the rest feels so rushed. Once the four get their powers the whole thing fast forwards a year and skips the little things like coming to terms with their powers and learning how to use them. They’re already experts after the time jump and are involved in a really half baked plot by the military to apply their powers for their own agenda. For me the appeal of the Fantastic Four was always that family dynamic and the fact that they are all very flawed individuals in their own way but stuck together. This film pretty much glosses over this where it could have spent some time exploring the origin of that dynamic. We could have seen the beginning of Reed and Sue’s relationship, Johnny learning how to grow up and Ben just becoming more comfortable in his new skin. These could have been very thematically powerful things to explore as they are all things that can be associated with growing up. Some attempt is made to show a flirtatious edge to Reed and Sue’s relationship early on but it pretty much disappears by the middle of the second act. It’s hard to really comment on the performances as most of the cast have very little to work with. Miles Teller does come across as a compassionate know-it-all which is consistent with his comic book counterpart but he never felt like Reed Richards to me. There was no real depth to his character and he had no arc to follow so it just came out as a collection of character traits. The same can be said for the rest of the cast with Michael B. Jordan’s Johnny probably getting the closest to an arc but even that is more or less resolved off screen. At least he can play arrogant really well. I did find Kate Mara’s Sue quite interesting but any chance she might have had to flourish was brushed aside like the rest. Jamie Bell never felt right as Ben Grimm to me but he disappears for a large stretch of the film and is replaced by CGI and a bland voice-over when he does return so he is absolutely worse off than anyone else. Toby Kebbell’s Victor Von Doom/Doctor Doom is a massive problem here. When he was first introduced he seemed to be a rival to Reed but there was a mutual respect between them that allowed them to work together on the common scientific goal that united them. There also seemed to be some jealousy at how Sue seemed to warm to Reed and not him. If you hate love triangles then don’t worry, the script can’t even be bothered to get that right. It disappears almost as quickly as it’s introduced making me wonder why it was even in there at all. Like Ben he disappears for a large stretch of the film and when he returns he’s suddenly an evil villain bent on destroying the world. His trip to planet plot device somehow makes him one with nature and able to control the alternate dimension for reasons that are never made clear. To say he had shaky motivation would be a complete lie, he has no motivation and only wants to destroy everything because the team need something to bring them together in the dull CGI filled final bout. For those of you not familiar with the comics, Doctor Doom is kind of a big deal. He is high up in the pantheon of Marvel super villains and has endured since very early on in the publication of Fantastic Four comics so to have him reduced to a 1 dimensional world destroying maniac does a serious disservice to the source material. Seeing him end up this way actually makes his introduction in the first act feel pointless since the attempt to set up a pseudo antagonistic yet respectful relationship between Doom and Reed Richards goes absolutely nowhere. Also, why do the film adaptations insist on continually giving Doctor Doom super powers. The entire point of his character is that he doesn’t need them as he is able to harness and control power in other inventive ways. It’s his intellect that is the threat rather than any tangible super power. It may seem that I’m comparing this film to the comics a lot and I concede that I am but this is the first adaptation in a long time that I feel actively insults the material it is based on. Lots of changes were made to X-Men but in general terms the characters and stories still feel like they fit within that framework. I welcome most of the changes made in the X-Men films because I can see the reason for doing so and they translate to something that works really well on screen. This film is sadly the opposite, none of it ever felt like the Fantastic Four to me. I don’t have a problem with some of the things changed like the race of the Human Torch and Doom’s involvement in the origin story. All of this would have been fine assuming the spirit of the thing was right. They did manage to get the powers right for the most part and they did look great. Reed’s stretching ran the risk of looking utterly ridiculous but it was pulled off convincingly. Sue’s forcefields had some questionable sound effects but looked cool and Johnny’s flame powers were absolutely spot on. Ben Grimm’s Thing form isn’t something I found visually appealing and I just can’t get used to him not wearing trousers of any kind. I did like some things. Some of the early character work really felt like it was onto something such as some of the initial interactions between Sue and Reed. Teller and Mara had decent chemistry in some scenes which filled the gaps that the writing couldn’t. Similarly Teller and Kebbell bounced off each other really well to create some passable Reed/Doom banter early on. The initial scenes showcasing the powers as being out of control and horrifying were also quite effective and Doom’s introduction as he started his rampage was appropriately atmospheric. These are all moments that I liked but they don’t do enough to save this from being an overall underwhelming experience to sit through. I wouldn’t recommend this to anyone who is a fan of the Fantastic Four comics nor would I suggest that people who like superhero films watch this. There are better out there more deserving of your time. An underwhelming experience that fails to capitalise on the potential of the source material to deliver a solid reboot of Marvel’s first family. The biggest issue is that the story feels so disjointed. I couldn’t help but wonder if this started life as a dimension hopping superpower film that eventually had the Fantastic Four label slapped on it to ensure that there was an audience. Apparently it was always a Fantastic Four movie but that really isn’t evident. Most of the film is spent developing the technology to travel to another dimension and the rest rushes through the creation of the titular hero group. There was lots of potential to explore the blossoming group dynamic and spend some time as the characters get used to their powers but it skips to the point where they are all experts and most of their character arcs have been wrapped up. The cast do a good enough job but aren’t really given much to work with. Miles Teller and Kate Mara have decent chemistry in the beginning but it never really goes anywhere and Michael B. Jordan manages to play arrogant really well in some scenes. Toby Kebbell’s Doctor Doom is such a limp villain with absolutely no motivation to speak of. The point of this character is missed entirely and his presence feels like an insult to the source material that spawned this film. Some things were nicely done such as the powers. I’m not keen on the design of the Thing and I am constantly put off by his lack of wearing trousers but everyone had the powers they were supposed to. The action scenes were boring but there were some cool moments like the reveal of the powers and the start of Doom’s rampage. Sadly those small moments don’t add up to anything meaningful and amount to a really disappointing overall experience. Not one I would recommend to fans of the comic books or of superhero films in general. There are far better examples more deserving of your time. Wowser! Even if it’s as bad as you wrote, I do not think that this film deserved 3 out of 10. Maybe 4.5, maybe 5… well, at least, it’s a MOVIE, right? Not a bad one, a bit of a screwed-up… And faithful in something to ULTIMATE… but… well, I gotta watch it myself. You might have a better time with it than I did but I was far from impressed. I definitely think it is a pretty bad movie but that’s just me. Thanks for reading, hope you enjoyed the review.